Adult scooters are a newer ‘toy’ that’s been really causing a stir lately. All of us remember the fun times of riding around on scooters as kids, but it stopped eventually. We all have to grow up, right? Well, for some of us, it’s not always fun to give up on the amazing experiences of the past. In fact, regaining that youthful vigor that we all crave so much comes easily with adult scooters. The Razor A5 Lux Scooter is a fantastic example of a great adult scooter. Razor is well-known for their kid’s scooters, as well as their durability and trustworthiness in the industry. The A5 Lux Scooter has bigger tires, a wider base, and taller handlebars all to accommodate for a larger adult rider. While it might seem crazy to bring back the old days of riding around on a scooter, most adults find that it’s actually quite enjoyable! If you’re someone who’s been looking to spend more time outdoors or get a little bit more excitement in their life, then an adult scooter is a great solution. Instead of making you search all around the internet, we’ve done all the studying and research for you. The Razor A5 Lux Scooter is a true work of art, so we’re more than happy to share all that we’ve learned! 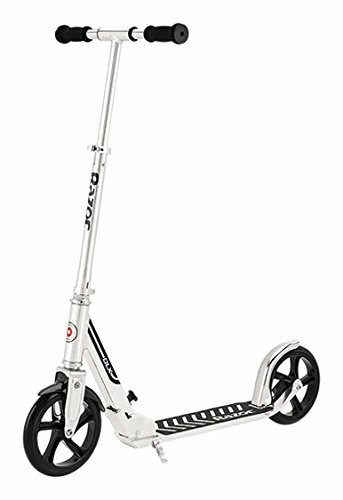 The A5 Lux Scooter is made specifically with adults in mind. It might seem silly to think that some ‘adult’ scooters don’t really cater to their target audience, but it happens all the time! Either the deck is too thin or too short, or the handlebars don’t go up high enough. Some adult scooters don’t even support weights over 180 pounds, which is crazy since a massive part of the adult population is well over that limit. Luckily, the Razor A5 supports up to 220 pounds, which is more than fair enough. You shouldn’t have to worry about maxing out the limits of your scooter every time you ride. With the 220 pound limit, you can cruise with the peace of mind that it’s not going to slow down or break apart out of nowhere. It’s got the perfect limit to allow almost anyone to have a good time riding. Another great feature that caters to adults is the wide platform and the high handlebars. Have you ever tried riding a smaller electric scooter? It’s almost impossible to get both of your feet on the deck without stepping on your own toe or slipping off while riding. The good news is that the A5 scooter has an extra wide deck to support two adult feet, instead of one and a quarter adult feet! Durability, and reliability at that have always been a point of emphasis for Razor. Since their first scooter models many years ago, they’ve always had rust-proof and weather-resistant products that are designed for all environments. The Razor A5 Lux was no exception. It’s made with the same strong aluminum, which always proves to be excellent in all situations. Another awesome durability feature that the A5 scooter comes with is the anti-rattle lock. Remember when you rode over the cracks on the sidewalks, and every time you hit one it bumped and rattled? Well, this scooter has a special mechanism and design that doesn’t allow that annoying, monotonous rattle to interfere with your ride! It’s a pretty awesome feature and a unique one at that. Don’t worry about tacky brake systems either. Many other brands always have a rear wheel break that heats up when you press down on it, which wears down the tire over time. Unfortunately, some scooters don’t have a brake at all, which means you have to use your own shoe to slow down. Not only is this incredibly unsafe, but it also ruins your shoe. Why waste money on a product that breaks down another item you already own? The wheels on the Razor A5 Lux Scooter is probably the biggest standout. They’re massive! At 8 inches in diameter, not many other scooters can say they have anywhere close to that of the A5. Why 8 inches? Because scooters that have smaller tires usually end up being bumpier rides. When you hit a dip, even if it’s small, a smaller tire doesn’t react well. It dips in and bumps right back up, ruining the experience a little bit. Luckily, the Razor A5 has massive wheels that make the ride a smooth breeze. Instead of worrying about small divots, and cracks, you’ll cruise right over them without even noticing a difference. Reviewers are going wild about how happy they are with the performance of these tires. There’s no smoother ride for an adult scooter that you can find than the Razor A5 Scooter. The massive wheels are made out of urethane, which could also be a durability feature. Urethane is a hardened material that withstands damage from wear and tear very well, unlike many other cheap plastics that other brands sometimes choose. Urethane is well-known to last for years and years! All you need to stop is twist the left-hand handlebar to brake! All of the mechanism is highly sensitive and responsive, to ensure maximum safety. + Meant for an adult rider, with a longer and wider deck. This helps you position your feet better without feeling like you’re going to fall off, especially while riding. It also has adjustable handlebars that go to a much higher height then most adult scooters. + Durable urethane 8-inch tires that’ll keep the ride much smoother than smaller tires. Instead of a bumpy, annoying ride, you’ll enjoy a smooth cruise wherever you go. Urethane is well-known to withstand the worst of conditions while riding, which is also a plus. + The rear break is much more effective than other scooters’ brakes. It also doesn’t heat up like other competitors’ products do when slamming on the brakes. Especially when you’re going at higher speeds, you want your brake system to work immediately! 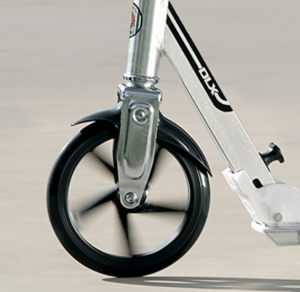 + The A5 Lux scooter is made out of a high-quality aluminum to avoid rust and breaking. It’s weather-proof and well-known to not bend, break, scratch, or damage in any other way. Instead of worrying about the rain every time, you can leave your scooter outside without a bit of stress. – Some people don’t like a single braking system, which is completely reasonable. Other adult scooters will sometimes come with a handlebar brake in addition to the rear tire brake for ‘in case of…’ scenarios. However, the A5’s braking system is far too reliable to worry about needing another brake. – The only other issue with this adult scooter is the foam handle grips. Many people prefer rubber or textured metals since they don’t wear down as easily from heavy use. Sometimes foam handle grips can break down over the course of a few years or so. The Razor A5 Adult Scooter is suitable for anyone looking to have a fun time. It’s always nice to get back to your roots and remember why you had so much fun as a kid. We all played on scooters, and since we’re adults we’re supposed to suddenly stop having fun for some reason. Enough with the no-fun attitude, if you’re looking to have a good time as well, the Razor A5 scooter is worth a look. Adults scooters are also suitable for someone who wants to have an alternative method of city transportation. 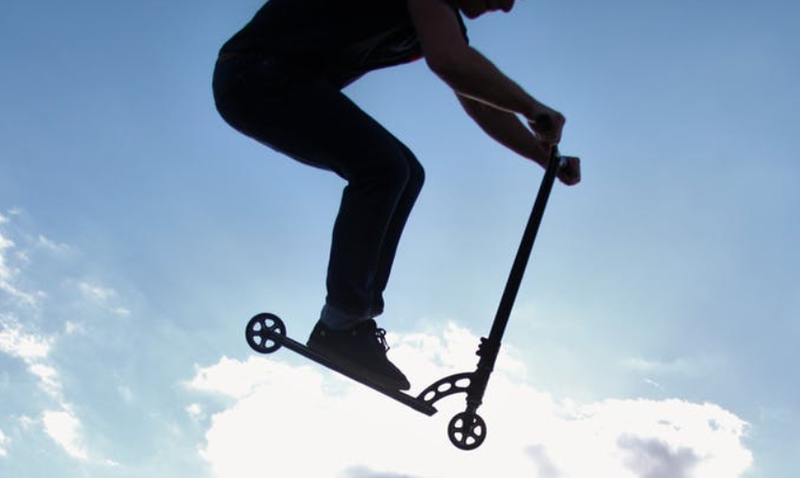 Whether it’s to school, work, or the store, or maybe even a friend’s house, adult scooters provide a reasonably quick speed with an excellent form of exercise. The A5 scooter, in particular, provides a very smooth ride to allow you to relax and enjoy the scenery around you instead of worrying about hitting that next bump or crack in the road. We like the Razor A5 Lux Scooter so much because it’s the ultimate adult scooter. It overshadows almost all of the competition in nearly all possible areas. Many other scooters use cheap metals that rust, while the A5 Lux uses high-quality aluminum. At the same time, the A5 Lux provides a wider platform to ride on so your feet don’t slip, while other brands’ scooters are far too narrow, and sometimes too short. This scooter truly is better than pretty much any other adult scooters in almost all aspects. When we came across it and saw all of the happy customers, we knew we had to share it! We also like the A5 Lux Scooter so much because it’s eco-friendly in every way. While there are all kinds of cars and gas-powered vehicles polluting the world, a lot of us are trying to search around and find ways to eliminate as much of our waste as possible. Adult scooters are an excellent way to reduce your gas emissions while having a good time and enjoying the great outdoors. All in all the Razor A5 Lux Adult Scooter provides a level of fun and energy-efficiency that only few things in this world can. With all of the additions that you need to have a blast, it’s time to start cruising around in style!